***(SOLD)*** This is a pair of early mid century 1950s mens swivel cufflinks with paperweight bubble crystals over enameled/painted tops of the Washington, DC capitol building. Overall, very good to excellent condition. They are completely original and have never been modified, altered or repaired. As you can see in the photos the top crystals and the scene of the capitol are fine. The swivel backs are also fine and swivel quite well but have some age wear. They are from an estate and not freshly polished. The tops measure 5/8″ square. This is a lovely pair of older bubble crystal painted cufflinks for your collection. This is a lovely pair of original vintage bubble glass patriotic cufflinks for your collection or display. 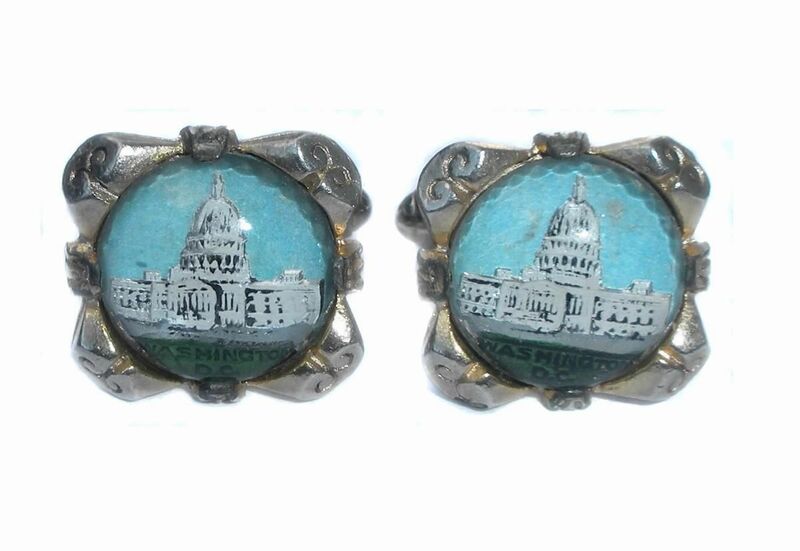 This is a pair of early mid century 1950s mens swivel cufflinks with paperweight bubble crystals over enameled/painted tops of the Washington, DC capitol building. Overall, very good to excellent condition. They are completely original and have never been modified, altered or repaired. As you can see in the photos the top crystals and the scene of the capitol are fine. The swivel backs are also fine and swivel quite well but have some age wear. They are from an estate and not freshly polished. The tops measure 5/8″ square. This is a lovely pair of older bubble crystal painted cufflinks for your collection. 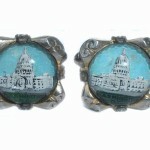 This is a lovely pair of original vintage bubble glass patriotic cufflinks for your collection or display. 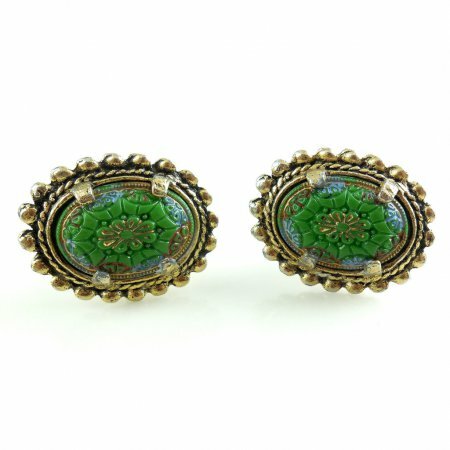 This is a pair of early 1960s vintage hand enameled fancy mens swivel cufflinks with carved molded or poured glass. Goldtone with an antique finish. Patent# 2920363. The deeply carved glass stones are beautifully decorated with hand applied turquoise, gold and red coral enameling. The tops measure 1" long by 3/4" wide. 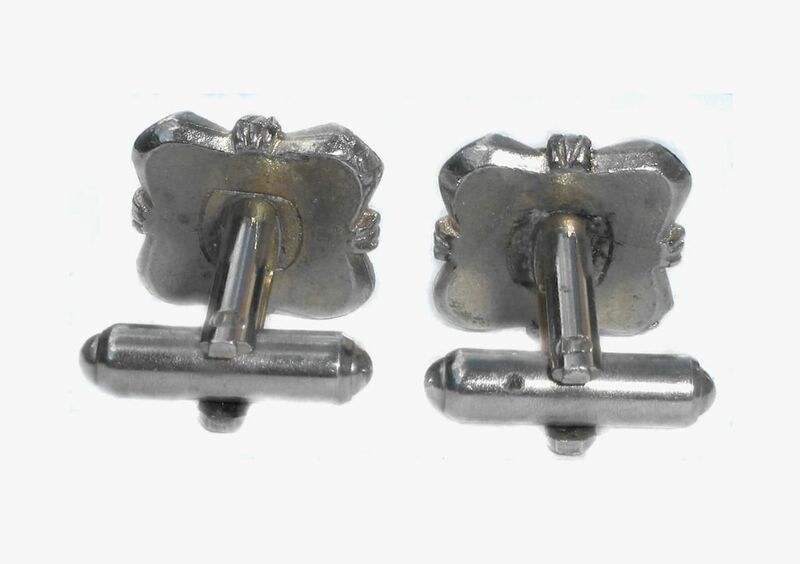 A showy pair of vintage 60s estate cufflinks for your collection. This is a pair of vintage Kinney mens cufflinks with blue and white enameled Carteret, NJ High School insignia/emblems. The tops measure 7/8" by 5/8". They are in excellent, well cared for condition. No missing silverplate. Minimal wear from age. Not polished out for brightness. The backs of the tops are still very bright and shiny. No dents or dings. Never monogrammed. Good working swivels. 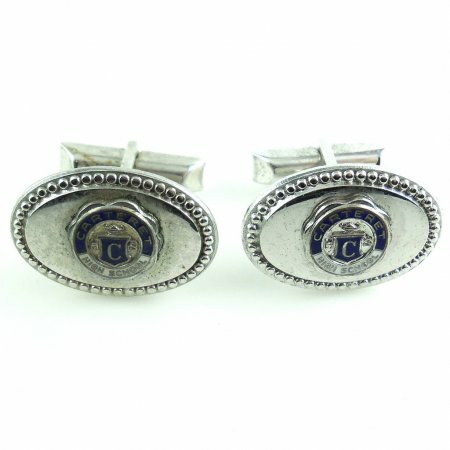 A lovely vintage find for any cufflinks collection especially if you are from Carteret, New Jersey. 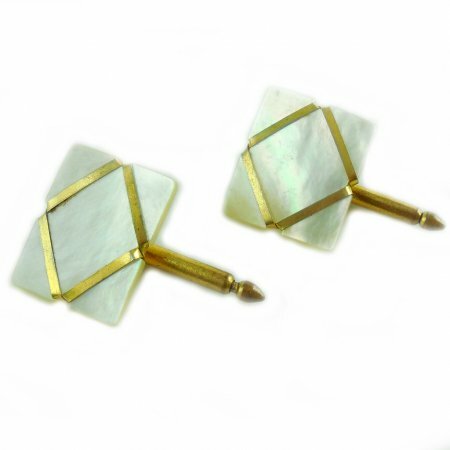 This is a pair of antique Art Deco gold filled/plated and pearl chain link cufflinks. The tops have have thick mother of pearl carved slabs with gold wrap in the carved recesses. Look more like filled than plated and have a nice geometric Art Deco design. The push pull backs are spring jointed. The pearl tops have soft pretty opalescence with hints of pastel roses, greens, and pinks in lighting. Size is 5/8" by 1/2" across the tops. 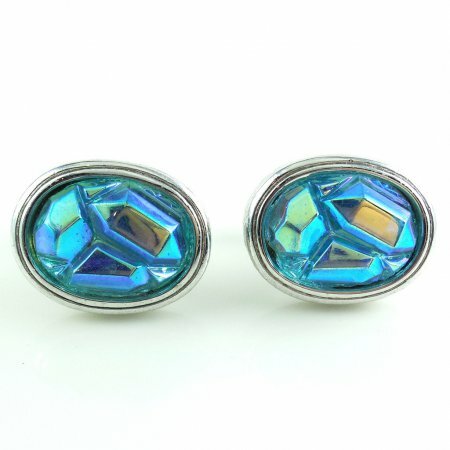 This is a stunning pair of vintage 1960s-70s neon blues, greens, purples auroral boralis glass cufflinks. They are heavy silver plated and in excellent used condition. No damage. No wear to the silver. No wear to the colors. The swivels work well. Size of each oval top is 7/8" by 11/16". 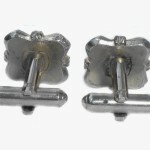 This is a lovely pair of vintage statement cufflinks for your collection. They have lots of flash and are very showy.